Bhaskar Pramanik, Chairman of Microsoft India said that there are about 35,000 apps currently available on the Windows Phone platform when Nokia launched its Lumia series in India. According to All About Windows Phone these numbers have increased and now there are about 40,000 apps at the Windows Marketplace. This means that content is being added at the rate of 165 items per day. In the last 30 days, 85% of submissions were apps and 15% were games; 68% were free, 23% were paid and 9% were paid with free trial. Right now there are about 40,189 items published and 10,882 were added in the last 90 days and 4,770 were added in the last 30 days. 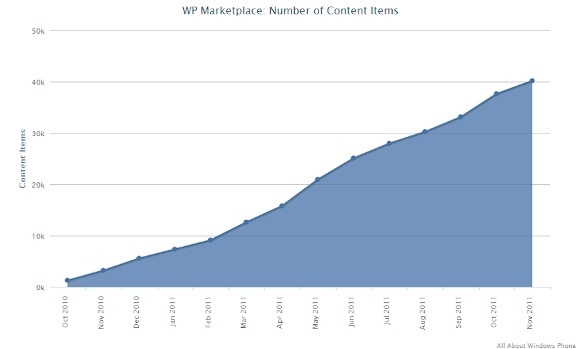 If numbers grow at this rate, the Windows Phone Marketplace should reach the 50,000 app mark in January 2012. Games is the single biggest category with 15% next three biggest categories are books and reference with 15%, tools and productivity with 14% and entertainment with 13%.